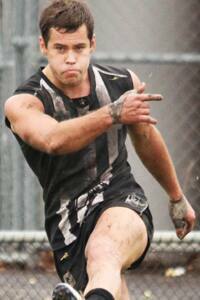 Ben Moloney had 28 possessions and seven clearances in Collingwood's 90-point loss to the Casey Scorpions on Saturday. Photo: Shane Barrie. Collingwood's impressive run of three narrow victories came grinding to a halt when it lost to the Casey Scorpions by 90 points in Saturday's VFL encounter at Casey Fields. After a competitive first quarter, the Magpies were completely overwhelmed by the third-placed Scorpions who kicked five goals in each of the second and third terms before closing the game with seven goals to two in the last quarter. “It was a very disappointing day. We just didn’t carry out what we planned to do,” Development Coach Anthony Rocca told collingwoodfc.com.au after the loss. Although the side lost the experience of Jordan Russell (ankle) and Andrew Krakouer (illness) before the match and entered the game without in form defender Adam Oxley (who was named as a senior emergency), it expected to perform better than it did against one of the competition’s most consistent teams. Recap collingwoodfc.com.au's blow-by-blow coverage of Saturday's loss. One bright spot was the form of Tim Broomhead who continued to illustrate why Collingwood's recruiters were so thrilled to draft him at pick No. 20 last November, gathering 22 disposals and kicking two goals (which made him his side's only multiple goal scorer). Defenders Peter Yagmoor and Nick Riddle battled manfully against the flow and tough onballer Ben Moloney played a lone hand beneath the packs, gathering 28 possessions and clearing from the stoppages seven times. Collingwood’s next VFL outing is against the Richmond-affiliated Coburg at Victoria Park next Sunday at 2pm, only hours before the senior team tackles the Western Bulldogs at Etihad Stadium.